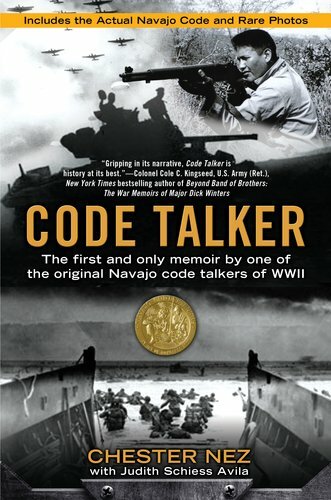 Code Talker: The First and Only Memoir By One of the Original Navajo Code Talkers of WWII He is the only original World War II Navajo code talker still alive—and this is his story . . . I'd say "riveting" is an overstatement. Unlike some readers, I had no trouble putting the book down. Code Talker is maybe 1/3 Nez's childhood, 1/2 the war, and 1/6 the rest of his life. So the bit about his "personal struggle to adapt to civilian life" is also an overstatement. That wasn't Nez's big issue. His real challenge, which I wouldn't call a struggle, was leaving the sheltered Navajo life for boarding schools and the big city. The book is fine on Nez's childhood. Especially if you haven't read biographies of Southwestern Indians in the pre-war years, when contact with the white man was still rare. It's great on the war years, where you get a real sense of what soldiers had to endure in the Pacific. I'd say it rushes through the post-war years...but nobody's necessarily interested in that part of Nez's story, so it's okay. My main cavaet is that nothing terribly dramatic happens. You want heartwrenching personal conflicts in stories like these. Nez overcoming the cruel boarding-school master! Nez overcoming the racist Marine sergeant! Nez in hand-to-hand combat with a deadly Banzai enemy! Nothing like that happened. If Nez hadn't been at ground zero during the formation and deployment of the Navajo codetalkers, we might not care about his story. What he witnessed is the interesting part--but witnessing isn't quite as compelling as struggling oneself. Those points aside, Code Talker tells you everything you'd like to know about the origin of the codetalkers. It's a must-read on that subject. And it's a solid entry in the broader category of Native memoirs.